According to Forrester’s survey, security and risk leaders reported that their organizations work with more than 4,700 third-party partners on average. And even with formal third-party risk programs in place, only 14% of respondents said they are confident that they effectively track all of their third parties. Cybersecurity risk rating solutions can help to close information gaps. They automate the collection and analysis of externally available third-party risk data to help users more accurately assess their partners’ relative cyberhygiene and risk exposure. 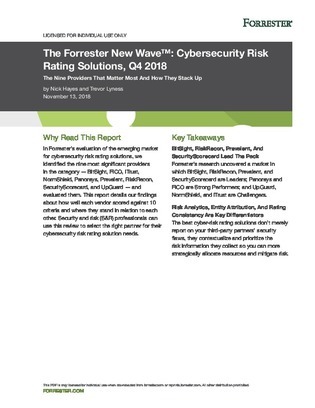 In this research report, Forrester evaluates the emerging market for cybersecurity risk rating solutions and identifies the 9 most significant providers in the category. This report can be used to help you select the right partner for your cybersecurity risk rating solution needs.